If you’re looking for a book that will break your heart and put it back together, look no further than The Fever King. 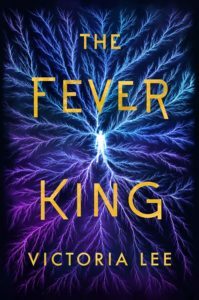 The Fever King is brilliant. It is a story about magic, about borders, and identities hidden underneath our skin. There’s all these added layers to this story about rebellion, injustice, and politics. There’s a dash of romance, to add flavor to the story, while at the center we have these characters of gooey goodness. Noam is a precious character who I just want to protect. He’s exactly who I’d be if I was in the story – craving approval, being tired of standing by, and wanting to tear the system down. While Dara is this flawed snowflake, but in the way you want to capture it in your hand and protect it from the heat, from melting. I have so many strong feelings for these characters. Noam is a bisexual Jewish snowflake. I want to just keep him safe and warm, without melting, and hold him in my arms. There’s a strength, a determination, a passion to him that I find infectious. At the same time, there’s also a vulnerability because Noam wants to act, even sometimes without thinking, and he craves approval. I could see myself reflected in Noam’s eyes. Wanting to stand up against injustice, to just do something, and as Noam comes into powers, his desire for action is stronger than ever. His fear that what he is doing will never be enough, that he will never be enough. And then you have Dara, who is this beautiful and flawed character, almost like a wild animal. He can be skittish and a little stand offish, and sometimes you aren’t sure where you stand with him. But he’s someone you can’t help but fall into their orbit. There are so many stories under his skin. Terrors, dreams, and hope. And as you learn more and more about Dara, you fall more and more in love with him. You cry for him. Don’t get me started on all our side characters as well! I know that we have only scratched the surface on his friends. And Lee is able to entrance us, to show us a glimpse, and instantly create intrigue. Plus the romance is the perfect addition to this mixture. It is slow burning and it really brings out the highlights and shadows of these themes. But what really captivated me in The Fever King are the themes. It is rich and multi-faceted, dynamic and complex. The world of The Fever King is one of papers, borders running through towns, and fear in everyone’s hearts. Part of what makes this book so powerful is the combination of stunning, and detailed, world building and themes that grip your heart. At the end of chapters, there are pieces of the past. Fragments of interviews or newspapers that tell us a story, a history. It’s about inter-generational trauma, crises of identity, refugees and immigration, and the manipulation, and control, of power. In some ways it’s almost like looking through all these mirrors of pieces of the past, present, and future. There are divisions between refugees, between those with magic, and in the middle of families. We are asked what creates a ‘monster’? And we also are asked, time and time again, what we are willing to sacrifice? Is one life the price you pay for a stable future? Are you still willing to pay it if it comes from your hands? It’s about sacrifices and death sentences we seal on envelopes with poison laced kisses. It all becomes compacted as the danger and loss creeps closer to our own home, our last shred of our heart, like a rolling fog at dusk. When one glance foretells a sinister future, a terrible past, or a present generation of rebellion. It is a book that examines choices. When there’s an absence of real choices, a tenuous balance between doing what we must and what we want. It is a book about grief. For parents, a life lost, and a world destroyed. A world where our roots can so easily be torn away. And it’s a book about living in the shadows of monsters in white coats. Find The Fever King on Goodreads, Amazon, Indiebound, & The Book Depository. Are you a fan of X-Men? Doctor Who? Morally grey characters? first of all, this is such a beautiful review!!! i’ve never really seen x-men or dr. who. blasphemy, i know. my sister was obsessed with the animated dr. who for a couple months so i watched a few random episodes out of order and was SO CONFUSED that i pretty much gave up. do you recommend the non-animated versions? is the animated version the main version??? I am STILL CONFUSED. i remember i used to wear a storm shirt but i never saw the actual x-men movies or read the comics so whenever ppl asked me about it i would just nod and try to act knowledgeable haha. i was a fake fan!! !